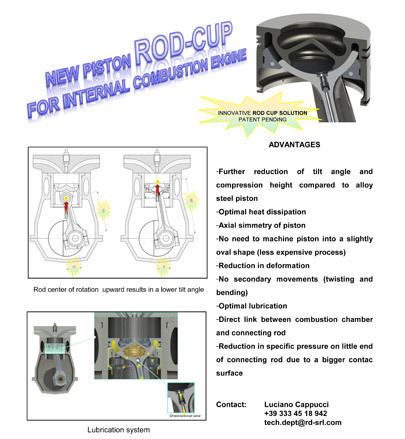 The main application of the concept CUP-ROD is designed for big diesel engines. Traditionally, most applications use aluminum pistons compared to steel that results in a considerable reduction in weight. Our project is to completely change the architecture to connect the piston to connecting rod drastically reducing the masses of both components and resulting reduction in weight. Precisely because of an overall reduction of weight we reconsidered the steel piston that has a large mechanical resistance to heat respect than the aluminum alloys. The real reason that led us toward the steel "is not limited to the strength of the material," but gives us the possibility to reduce the clearance (piston skirt and piston) optimizing the geometry of the profile. In doing so we can get a piston with a very accurate coupling with a consequent reduction of release of unburned fuel in the exhaust, which in the heating phase, increase the grade of smoke the diesel. This benefit is impossible to obtain with aluminum pistons because the profile is realized with a very pronounced conicity. Because we must take into account a more expansion of aluminum. For this reason, heavy industry uses the steel piston to reach the Euro 6. It's also clear that the higher mechanical strength allows more specific powers hence a better ratio of fuel / comburent. Another very important aspect that it is worth emphasizing, is the ability to reduce the temperature of the piston just below the point of flame. Normally the lubrication and consequent reduction of the temperature on the piston is forced from the crankshaft toward the piston dissipating the heat in a very approximate. The cause is the actual architecture of the connecting road gudgeon pin and piston. Our project has completely revolutionized the state of the art. We removed the gudgeon pin and through a channel can bring it directly cold oil below the fire point. Heat Dissipation Lubricate of the piston skirt and connecting piston. This project does not only optimize the engine with new project but you can 'think of also a regeneration of the obsolete and polluting machines that currently, with new laws, must be abandoned. Obviously we have mentioned some salient points that motivate research and development of this concept. We are very glad to talk with you about any questions or discussions that may facilitate understanding. In addition to the multiple potentialities and innovations in the piston ROD CUP, a further very important aspect has been focused; in order to prevent piston rotation, the extreme versatility of the concept allows an effective solution without limiting its benefits. © 2013 Copyright. Tutti i diritti sono riservati. Credits by KRESCENDO Multimedia S.r.l.